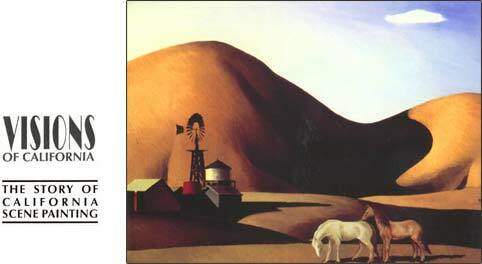 THE DECADES OF THE 1930s AND 1940s stand out as an intensely inward looking period in American art history. The social and economic upheaval brought about by the Great Depression caused many American artists to reject European influences and to seek distinctively �American� themes and idioms. The resulting phenomenon, known as American Scene painting, fueled the development of regional schools of art throughout the country. In loose, geographically based groupings, artists drew inspiration from local scenery, history, and culture. On the West Coast, this movement gave rise to an original and distinctive body of art known as California Scene painting. In both Southern and Northern California, artists investigated their immediate surroundings with intense interest, interpreting the forms and rhythms of daily life. In this three-part public television series, interviews with artists such as Millard Sheets, Joan Irving, Palmer Schoppe, and John Langley Howard make the story of California Scene painting accessible, comprehensible, and vivid. The production also features remarks by several noted historians and cultural commentators, including Paul Karlstrom, Janice Lovoos, Robert Perine, Mike McGee, Susan Anderson, Harvey Jones, and Orville Clarke, Jr. This perceptive commentary, together with some 200 works of art, rare film footage, carefully crafted narration, and an original musical score, animate a rich but little known period in California art history. The first program establishes the social, economic, and cultural climate of the period, introduces key players in Southern California, and traces the emergence of American Scene painting from earlier approaches to art. It also discusses the direct and spontaneous style of watercolor painting that became an important hallmark of scene painting in California. 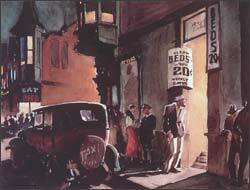 Among the artists discussed are Millard Sheets, Phil Paradise, Thomas Hart Benton, Grant Wood, Reginald Marsh, Ben Messick, Milford Zornes, Phil Dike, and Joan Irving. The second program describes the wide range of influences on the development of Regionalist art in California in the 1930s, including urban development, the Ashcan School, Modernism, and the art of Asia. It also examines the broad stylistic diversity found in both Southern and Northern California and discusses the way in which California Scene painters helped broaden the range and interpretation of landscape subjects in the West. Artists examined in this program include Rex Brandt, Emil Kosa, Jr., George Gibson, Palmer Schoppe, George Post, Lucien Labaudt, John Haley, Alexander Nepote, and Dong Kingman, among others.. The third and final program investigates Social Realism as a dimension of California Scene painting. It describes the impact of Mexican muralists like Diego Rivera on the development of public art projects in the 1930s, discusses the changing role of the artist at a time of national crisis, and examines the crossover between fine and popular art that occurred in the motion picture industry in the 1930s and 1940s. The program also reviews the significant role played by scene painters in chronicling the military campaigns of World War II. Featured artists and personalities include Paul Sample, David Alfaro Siqueiros, Fletcher Martin, John Langley Howard, Walt Disney, Phil Dike, and Millard Sheets. Visions of California: The Story of California Scene Painting was produced by Paul Bockhorst Productions for KOCE-TV (PBS, Orange County), with national satellite distribution via PMN. The narrator is Richard Doyle, and the original musical score was composed by Paul Morehouse. Funding for the series was provided by Fieldstead and Company, The Fieldstone Foundation, The Joan Irvine Smith and Athalie R. Clarke Foundation, and Friends of the Artists. All three documentaries are included on a single VHS videocassette, with each programs running approximately 28 minutes in length.